Thermoelectric cooling is now common in many applications. 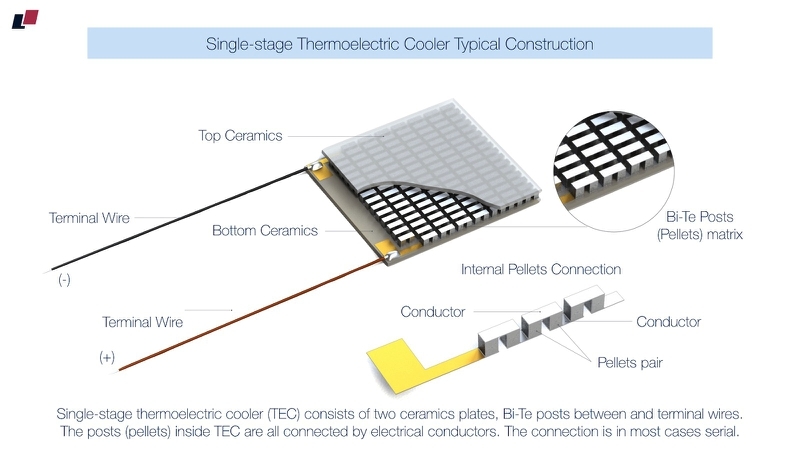 Thermoelectric coolers are widely used in many areas - from simple consumer applications like wine chillers or huge automotive industry with car seats cooling to hi-tech laser and optoelectronics applications with temperature stabilization applied in optical transceivers or for deep cooling of X-Ray and IR detectors. TEC is a solid state heatpump, it has no moving parts, available in a very wide dimensions range from 1x1mm2 to 50x50mm2, highly reliable and flexible in design to meet particular requirements. With recent advanced miniaturization achievements thermoelectric coolers become common for semiconductor lasers in telecom industry, mainly in applications with fiber-optical transmitters, where TECs stabilize temperature of laser diode inside. One of the key advantages of thermoelectric cooler is in it’s long life time, 25-30 years and more of continuous operating. And what is important - it’s maintenance free operating. 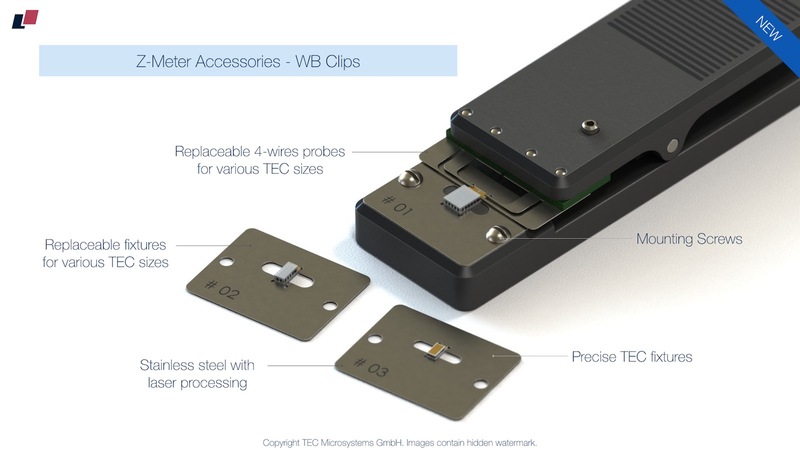 In terms of construction TEC is quite simple at first sight - in most cases it’s about two ceramics plates (for a single-stage TEC), BiTe posts in between and terminal wires or WB pads for power supply. The visually simple construction is in some cases suggests an idea that thermoelectric cooler is as simple and easy in terms of handling/mounting, as say a brick. But there are dozens of small and big factors that influence on TEC lifetime and create risks of damage or improper operating. Let’s take a simple example from some X-Ray detector application: thermoelectric cooler is mounted by epoxy on TO-8 header with a following detector unit mounted on TEC cold side, all related wire bonding applied, baking processing and final sealing with a cap. There is also a certain risk of TE cooler damage inside a final product during transportation to the end customer - for example, a heavy object attached on TEC cold side with vibration or occasional drop during transportation. There are also some other factors, sometimes invisible - for instance, assembly solder diffusion in BiTe material inside TEC, solder cold joint connections, partial cracks or detachment of pellets in TEC and many others. All these factors being not taken into account and not checked properly lead to big risks, reduced TEC lifetime, risks of poor performance and TEC fails. 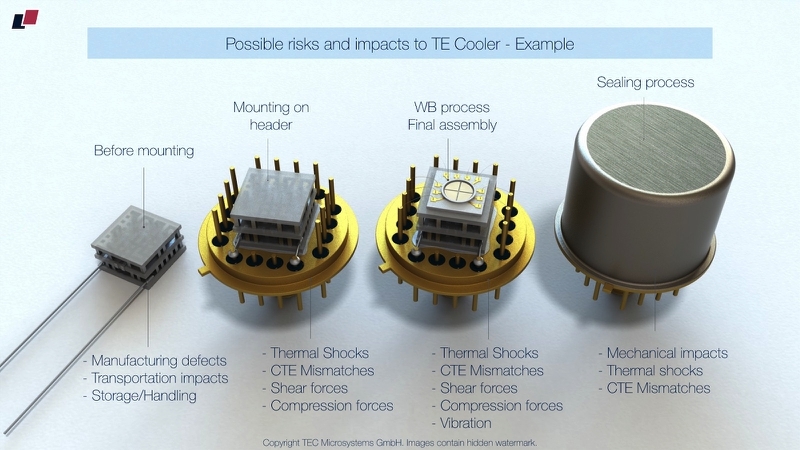 Thermoelectric cooler is a key component of active temperature stabilization. Once TEC is a part of a more complex and way more expensive components/systems, its fail at final assembly stage or after delivery to the end customer, leads to serious losses in terms of resources and reputation. If it’s installed properly it operates for years; but once it fails, the entire system fails as well. Thus TEC is a subject of detailed 100% inspection during every stage of manufacturing/integrating process. It means you need to check and control TEC parameters before and after every assembly stage with impacts that may have a risk to affect TEC conditions. And here comes a question - what TEC parameters should be controlled and how? The most common method is TEC AC Resistance (ACR) checking. Significant TEC AC Resistance (ACR) growing means mechanical damages inside TEC in most cases. Sudden ACR drop may mean partial shortcut between pellets inside - for example because of dew point and moisture inside, or some electroconductive material getting inside TEC. Serious ACR change (more than 5% from nominal value), points to serious problems with TEC. Electronics Industry Standard Telcordia GR-468 (based on MIL-883) set 5% ACR change as a criterion of failure. In fact it means that TEC may continue to operate, but certain destructive processes are already present. For example, micro-cracks in BiTe posts material, which will grow with time and lead to complete failure. 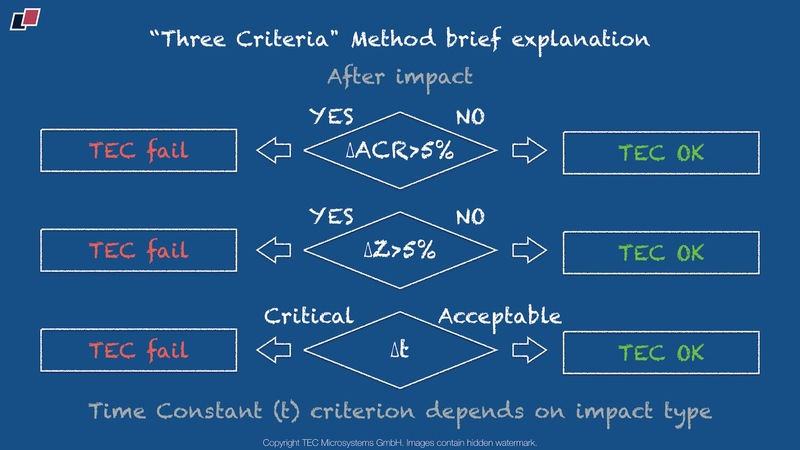 So, ACR change beyond 5% limit already means that TEC should be rejected in case of a proper quality control. 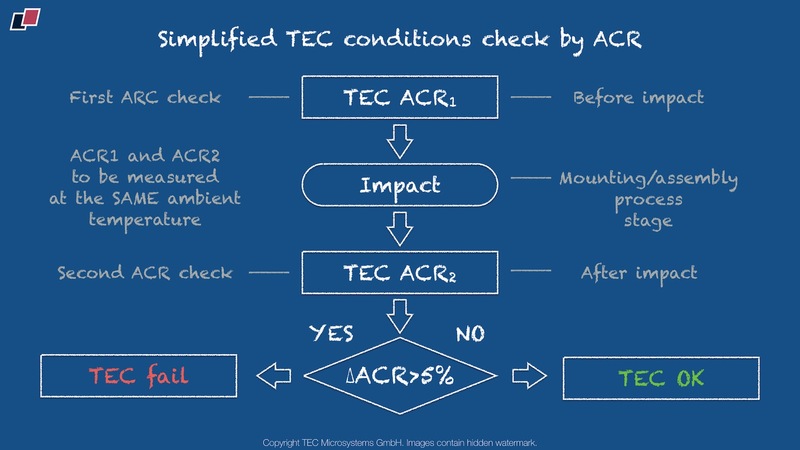 In practice it means that TEC ACR to be checked and compared on “before-after” basis for any impact to TEC. This allows identifying damages and all risky mounting procedures with TEC. What is important to note here is that TEC ACR to be compared always at the same ambient temperature - because it depends on ambient temperature. TEC ACR grows with ambient temperature roughly by 0.5% per 1ºC. It means that if you checked TEC ACR at 22ºC before mounting process, you should measure it again after - also at 22ºC, or recalculate the value to the same ambient temperature. Otherwise there will be a distortion. But there are situations with ACR staying pretty much stable, while thermoelectric cooler performance is getting worse. For example, this can be a result of thermoelectric material degradation, connected to the operating at too high temperature, or TEC electrical power supply exceeding recommended TEC Imax/Umax limits. For this case, it is not sufficient to check ACR only. 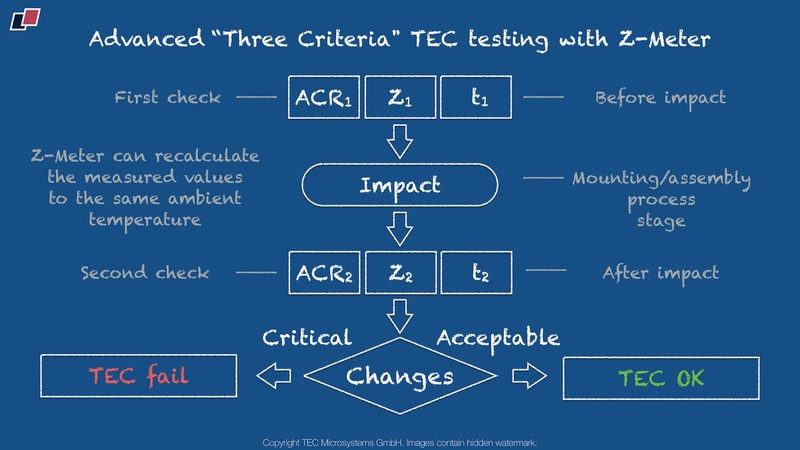 There should be additional criteria for TEC testing. Finally, there are situations with TEC conditions OK, but overall performance is far from expected. For this case (if skipping an excessive heatload and similar factors), there can be a problem in TEC mounting. For example, poor contact to a heatsink, voids in glue or solder layer between TEC and heatsink, TEC detachment from heatsink. For such case simple ACR check doesn’t work. There should be other testing criteria. 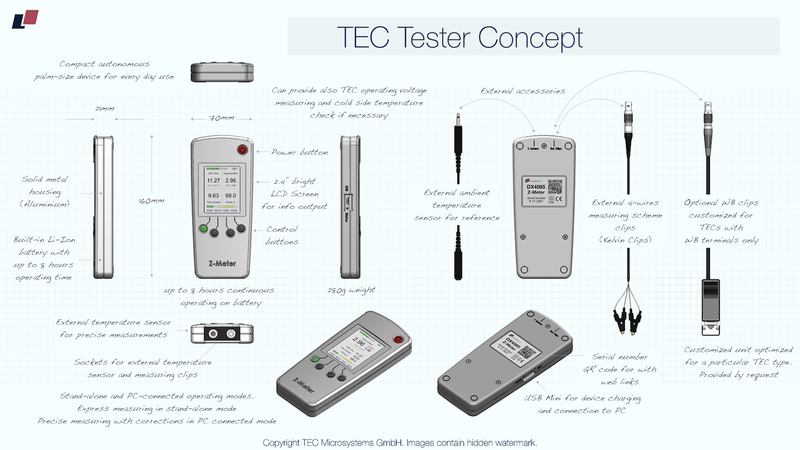 Thus we are back to the main question - what are the key TEC parameters to check, and how to check them. 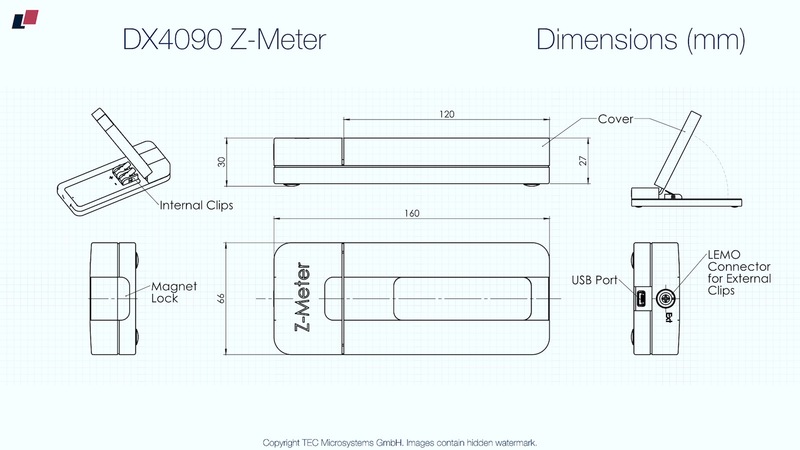 And the reply here is - Peltier Z-Meter. 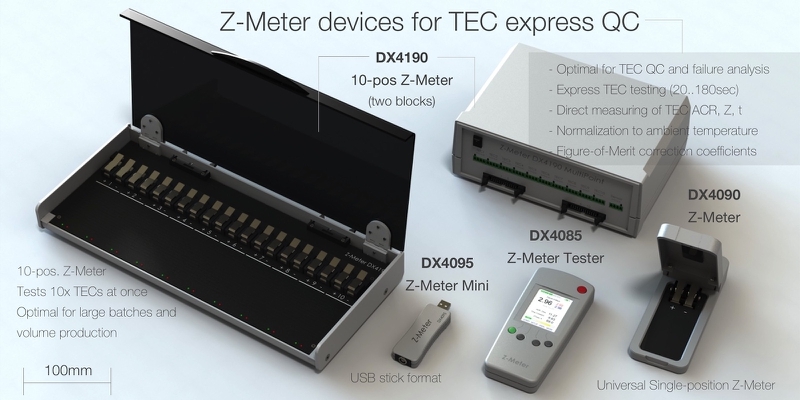 Z-Meter is a device for express TEC quality control and testing, developed by our specialists experienced with all aspects in TECs manufacturing and handling. Z-Meter uses Harman method and measures directly three key parameters of thermoelectric cooler: TEC AC Resistance (ACR), Figure-of-Merit (Z) and Time Constant (t). ACR value is required for comparison analysis, Figure-of-Merit (Z) value characterizes TEC quality and performance level, Time Constant shows in very simple words the "TEC cooling rate" - the time TEC requires from switching on to a reach the stable cooling mode level. 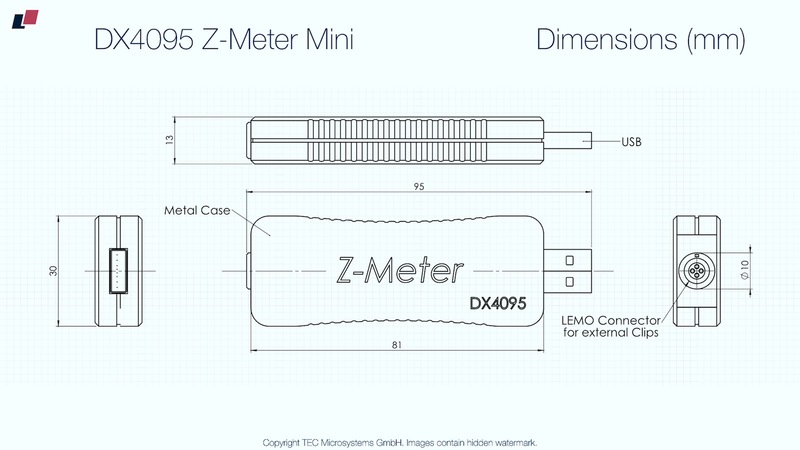 Z-Meters can be used both - by TEC manufacturers and TEC consumers. The greatest benefit of Z-Meter is in ability to implement express testing for all TECs in manufacturing or assembly process, apply 100% QC in manufacturing. The measurement process takes 20 to 180secs (depending on TEC type), it’s non-destructive, has no effect on TEC visual conditions and gives the complete info about TEC with three key parameters. 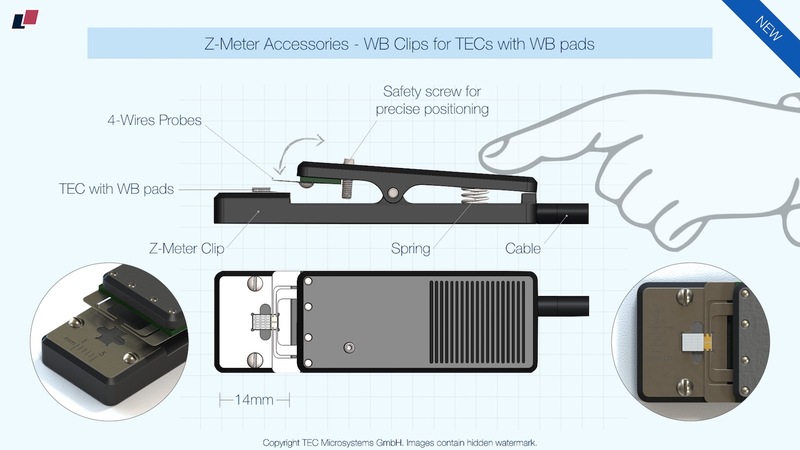 With Z-Meter you may test all mounting/assembly processes with TECs, analyze the risks and develop the most optimal and safe TEC mounting methods. What is also important - Z-Meter allows analyzing TEC quality and performance level using Figure-of-Merit as a key criterion. This is important for big projects where several TEC suppliers are involved. All provide the same solution, but certain difference in quality and performance always present. It’s possible to compare the same TEC solution from multiple TEC vendors in your project and select the best one. Figure-of-Merit (Z), being measured directly by Z-Meter, allows calculating actual TEC dTmax level for a single-stage TECs. With Z-Meter you may build efficient income TEC QC, check and analyze all the aspects of your TEC integrating process, study risky moments in your TEC mounting process and analyze impacts that affect TEC conditions. Z-Meter helps to reduce or eliminate the risks of TEC damages during mounting/handling. It saves time and money. 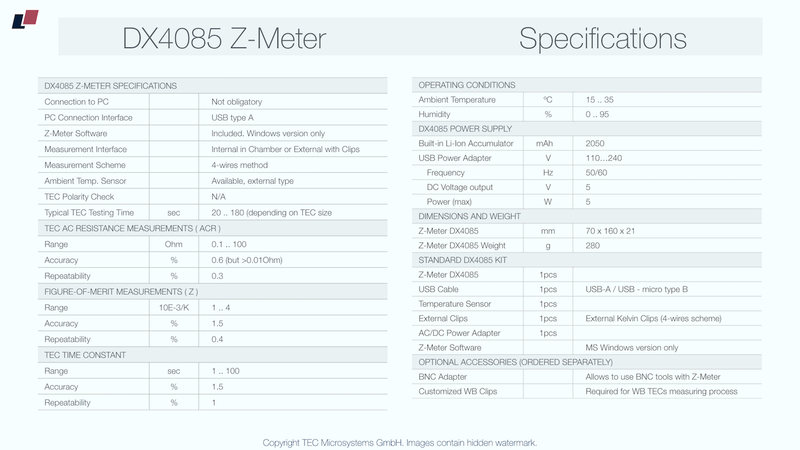 With Z-Meter you may check every assembly step using “before-after” criteria and be sure that TEC was not damaged. It means that after final assembling/sealing you get a confidence in TEC actual operating parameters, cooling performance and expected lifetime. Z-Meters are necessary for failure analysis as well. It’ possible to identify mechanical or overheating reasons of TEC failure. This is important if you deal with some already sealed device having TEC inside, but not accessible for visual inspection. For example, a portable X-Ray detector with thermoelectric cooler inside was dropped, TEC has malfunctions and poor cooling performance after - it’s possible to identify with Z-Meter the character of damage w/o entire device disassembly. ACR check will point to mechanical damage of TEC. A reduction of TEC Time Constant will point to a partial or complete detachment of TEC from a header inside the device. Another use-case - LD optical transmitter with TEC inside, certain drop of cooling performance, while TEC ACR is OK. Check TEC Figure-of-Merit, and if it’s lower than initial values, then you probably deal with BiTe material degradation, and this can be a result of operating at too high temperature. Thus Z-Meter allows identifying the reasons of failures for warranty service. 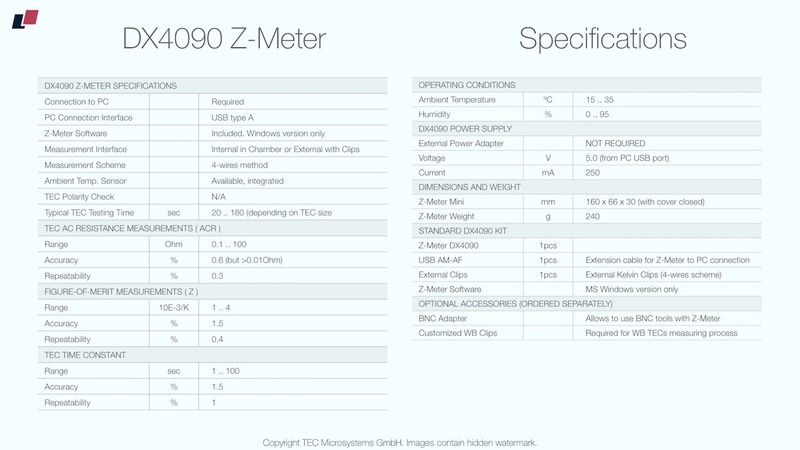 Z-Meters are ultimate instruments for TECs analysis and QC, with a lot of possible methods and ways to use. 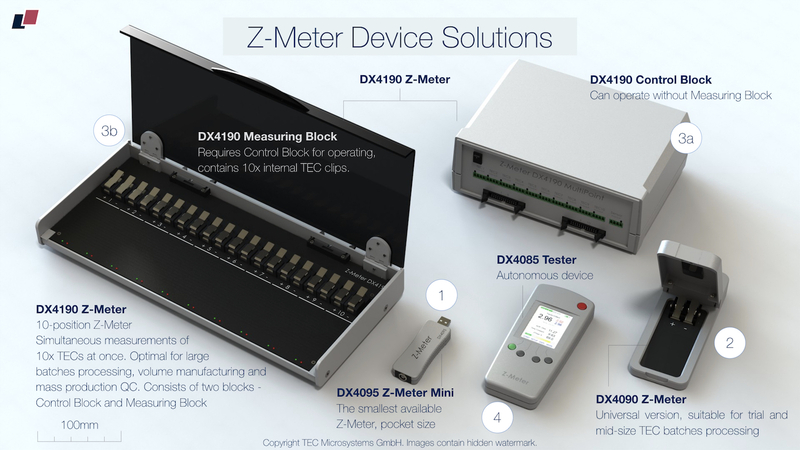 Z-Meter devices are available in four versions - Z-Meter Mini (DX4095), Z-Meter DX4090 , multi-positions Z-Meter DX4190 and portable autonomous Z-Meter Tester (DX4085) The measuring methodic are the same for all, the difference is in a application purpose, some extra features and TEC terminal interfaces. Z-Meter Mini is a pocket-size TEC tester, as small as USB flash drive. It’s optimal for small TEC batches testing, R&D analysis, quick occasional check of suspicious TEC or assembly with TEC. 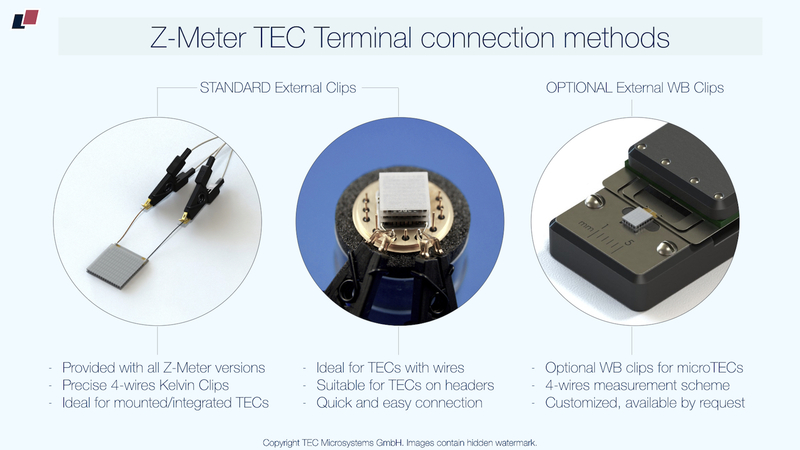 The device has only external clips for terminal connection to TEC. 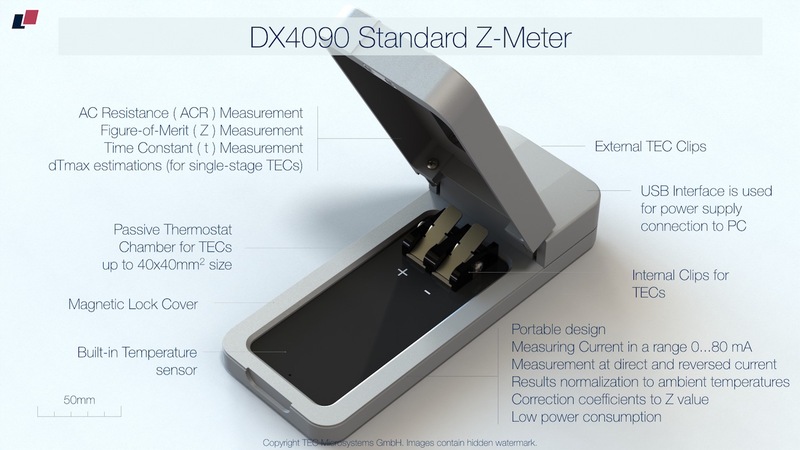 DX4090 Z-Meter is a universal laboratory device, suitable for R&D analysis and occasional QC testings, or regular QC procedures for small and mid-size batches in manufacturing. 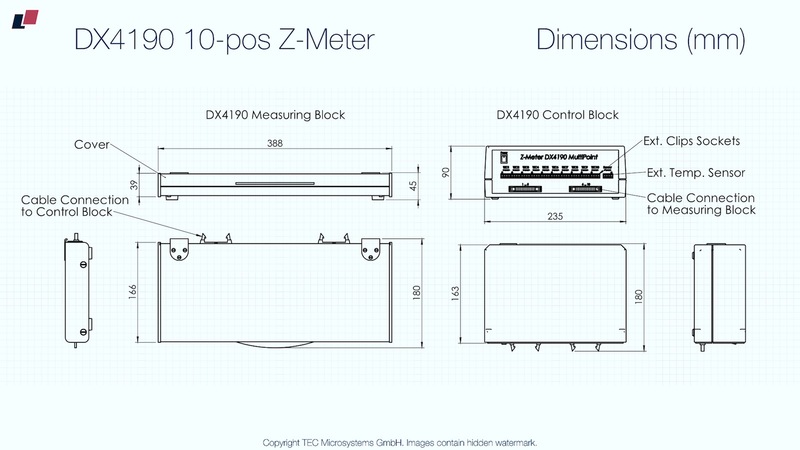 DX4090 has two terminal interfaces - external clips (the same as Z-Meter Mini) and internal chamber with clips for batch measuring processed. In brief words separate (not mounted TECs) are easy to control with internal chamber testing, while mounted (integrated) TECs can be reached using external clips. 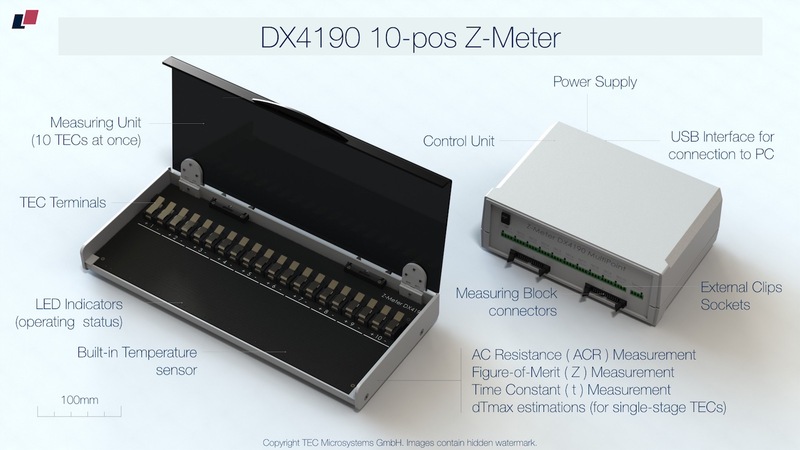 DX4090 has solid metal case, and works as a passive thermostat during measuring in the internal chamber. This is important if you check very miniature TECs, so small that they are sensitive even to air flows in the room. 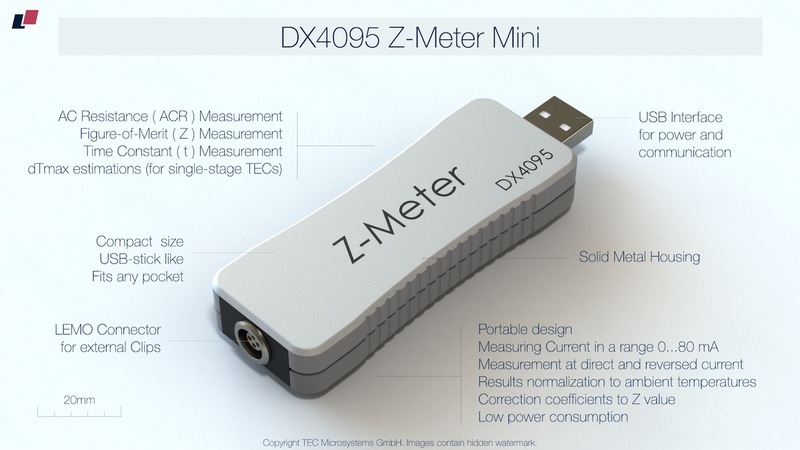 DX4085 is portable autonomous Z-Meter, developed as TEC Tester. It has a built-in Li-Ion battery, 2.4" LCD screen for information output and additionally to ACR, Z, Time Constant it can monitore TEC operating voltage and temperature (with external thermal probe). 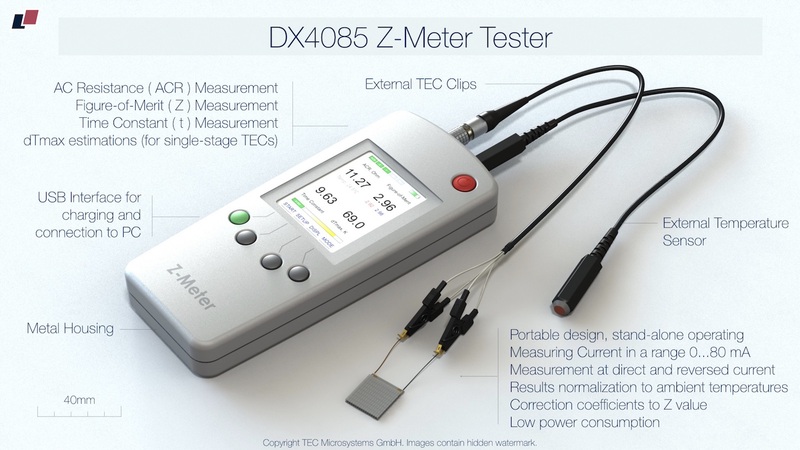 Finally DX4190, this is a 10-position Z-Meter, must-have device for volume manufacturers with large TEC batches testing. It measures 10x TECs at once, which significantly accelerates QC process. 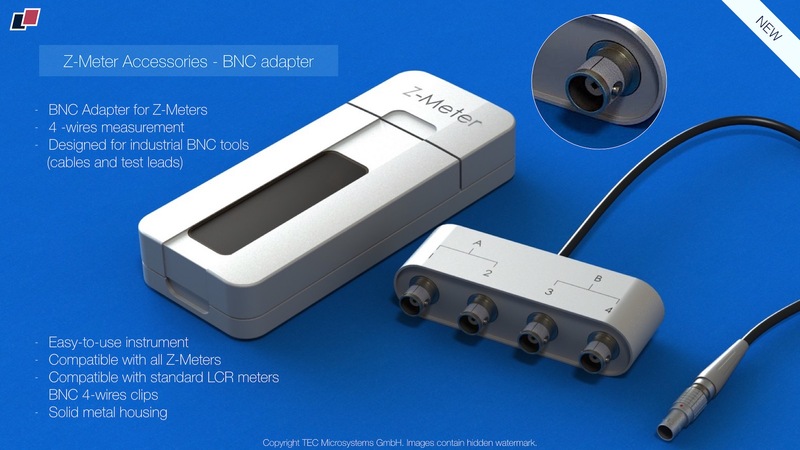 And it’s more efficient and affordable by price and usage than 10x separate Z-Meters in the lab or QC department. 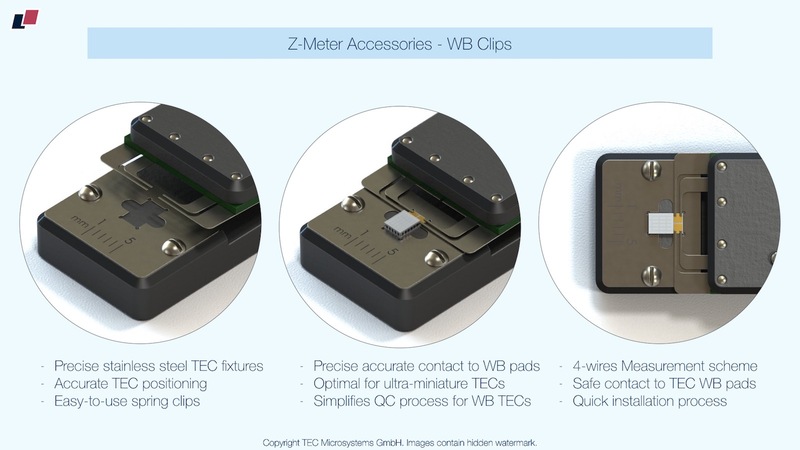 All Z-Meters can be equipped by request with extra accessories for additional measuring process simplification - special clips for TECs w/o wires (with WB pads or posts), sub-assemblies in standard headers (for example Butterfly package with TEC inside, or TEC on TO-8. It’s possible to provide even special heating tables to use with Z-Meter and analyze for example TEC ACR dependence on ambient temperature. 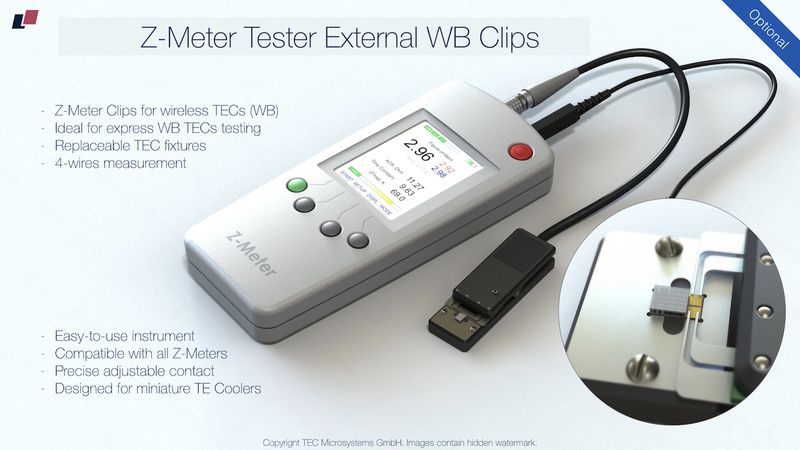 TEC Microsystems GmbH provides the entire range of Z-Meter devices with all necessary instruments for efficient TEC quality control. 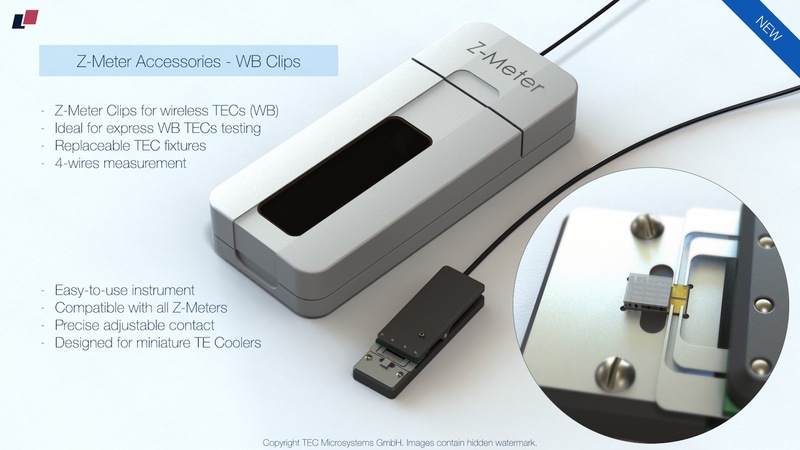 Z-Meter is a must-have device for any company that seriously works with thermoelectric coolers or devices with integrated TECs. 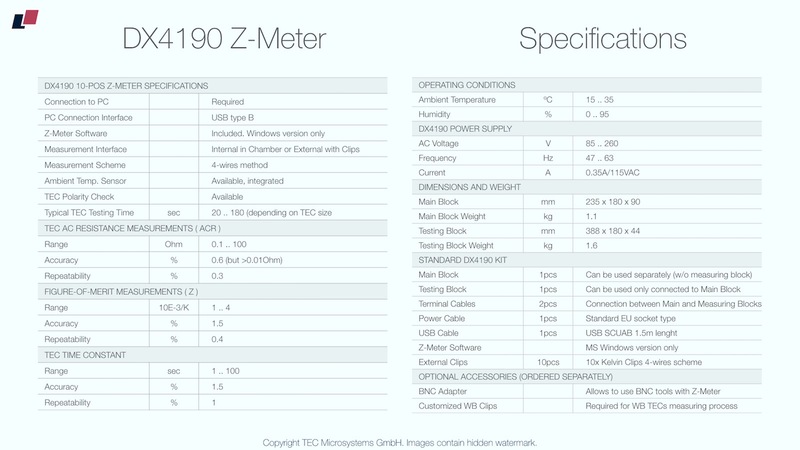 TEC Microsystems provides an entire range of Z-Meter devices with accessories and if required customization for customer application. 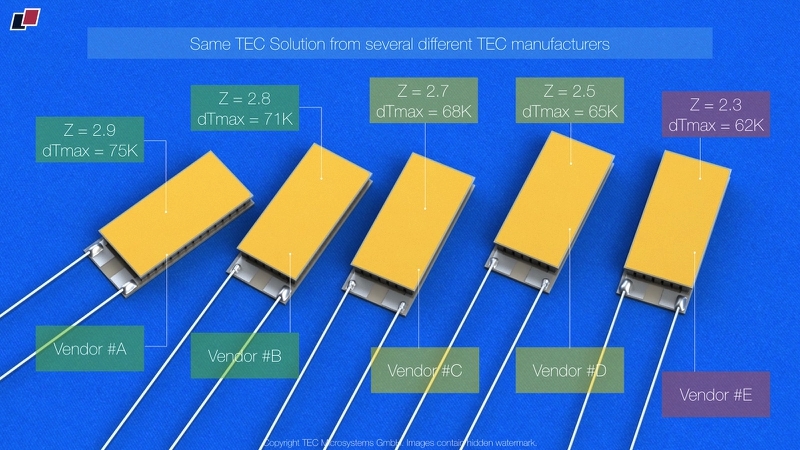 TEC Microsystems provides also development and integrating of the comprehensive TEC R&D and quality control systems for customers working with thermoelectric coolers. First, there is a certain risk of improper TEC quality provided by vendor - manufacturing and quality control level risks. Even in case of very reliable and well-known TEC manufacturer, certain risks are present and have to be taken into account. TEC Storage conditions after delivery and before assembly (stock temperature and humidity, mechanical impacts, unexpected accidents). Thermal shocks, mechanical impacts, overheating during TEC mounting (all the related soldering processes, heating and cooling impacts, WB processes, baking/annealing - can be applied to TE cooler multiple times). Material CTE mismatches (for example, TEC mounting on Copper or Aluminum), multiplied by thermal shocks during soldering or baking processes. All mechanical impacts during mounting and/or WB processes (compression forces, shear forces, vibration and etc). Thermal and mechanical impacts during final sealing (header cap welding process, for example).